My upcoming novel Blood Moon: A Captive’s Tale tells the story of Sarah Wakefield, a woman who was taken captive with her two young children during the Dakota War of 1862, which took place in southern Minnesota. Between now and publication in June, I will be sharing background about the war and a few excerpts from the novel. Today, I will talk about Little Crow, the Dakota warrior who was the chief Indian leader during the fighting. During the early 1860s, the Dakota people of Minnesota lived on a reservation along the Minnesota River, having ceded the rest of their lands to the U.S. government. The reservation was divided into the Upper reservation, home to the Sisseton and Wahpeton bands of the Eastern Dakota, and the Lower reservation, home to the Mdewakanton and Wahpekute bands. 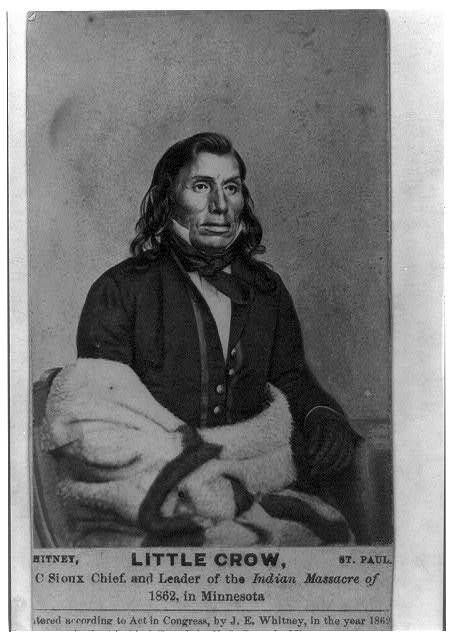 Little Crow, more properly called Taoyateduta (His Scarlet nation), was a chief of the Mdewakanton. It was four young men from his band who committed the massacre at Acton, the event that began the Dakota War of 1862. Late in the afternoon as we draw near the agency, we pass through several Mdewakanton Sioux villages—including those of Big Eagle and Little Crow. In each, tepees and bark lodges cluster around a common central area, and in Little Crow’s village, a still-unpainted, two-story frame house stands. The sharp scent of freshly cut lumber hangs in the air. Bob, the teamster who drives my wagon, says that the government recently built the dwelling for the chief. I have seen Little Crow only once, but I remember him as a handsome man in his fifties with an intelligent expression in his hooded eyes. John has told me a great deal about him, having learned bits of the story from Galbraith. Taoyateduta or “His Red Nation,” as Little Crow was originally called, was a wastrel as a youth. He traveled out west where he hunted buffalo, traded furs and whiskey, became a proficient poker player, and married and divorced a couple of wives. The Sioux say he matured only after his father died, leaving the chieftainship to a younger half brother. Taoyateduta returned to his father’s village to challenge that decision, and two of his half brothers shot him through both forearms, mangling his wrists and crippling his hands. His bravery on that occasion won him the band’s loyalty, and he became chief, adding his father’s name of Little Crow to his own. As a leader, Little Crow is said to be educated, charismatic, pragmatic, and full of contradictions. He urges his people to farm but will not plow his own land. He dresses in white men’s clothing but still wears a Sioux medicine bag. He attends Dr. Hinman’s Episcopal mission but refuses to convert. Little Crow’s paradoxes fascinate me, as I too struggle to find middle ground, striving to balance the strangling propriety of my New England upbringing with the freedom—and dangers—of my current life. Once the Acton massacre occurred, Little Crow was overtaken by events. He knew that war might be possibly destroy his people, but as a respected chief, he felt he had no choice but to lead them in the fight. He survived the war and escaped to the west. The following year, he returned to Minnesota with his son, was recognized, and murdered.